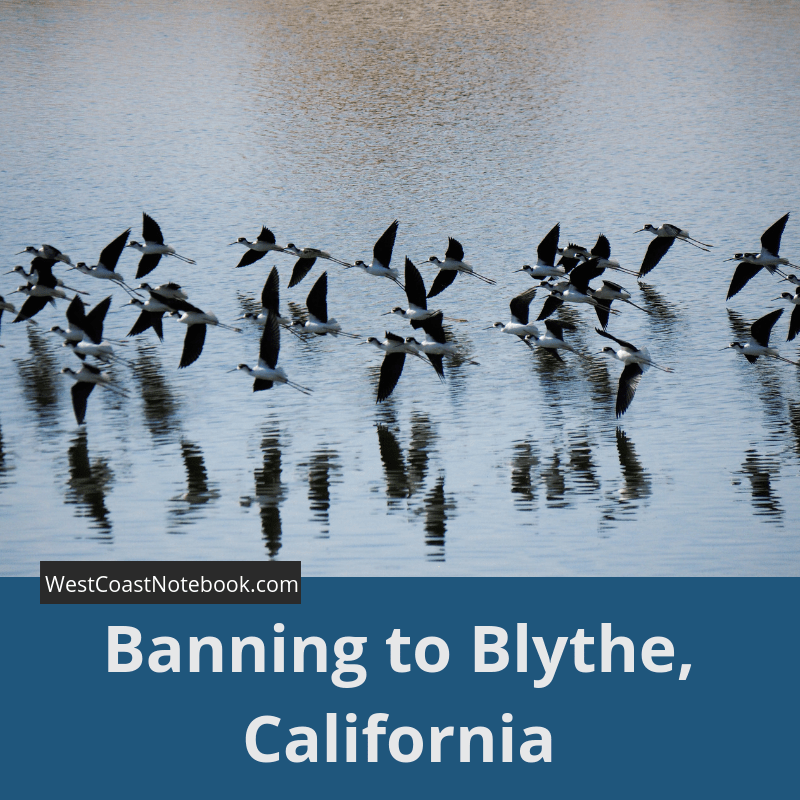 Today we made it from Banning to Blythe, California but not by the way you would expect. Instead of going down highway 10 and instead of it taking two hours we took the long route. 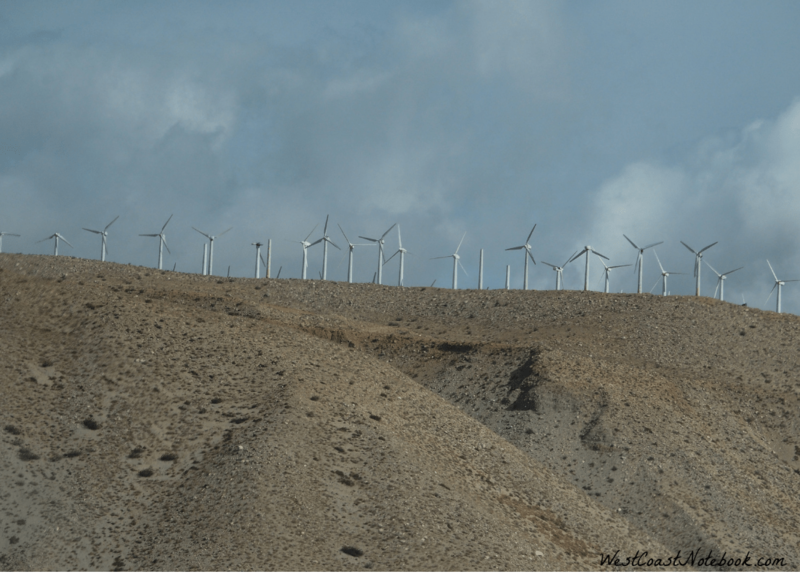 There were massive amounts of wind turbines along the way and I shot this picture out the car window. Doing a little backtracking we went down highway 10 to Indio and then headed south to go down the east side of the Salton Sea as it was supposed to have the best birding. This involved a little detour as we had to stop and ask directions (we are getting good at that) when what was posted as the road name was not what was on Google but we finally ended up on highway 111. This side of the sea was much different than the west side. Not so much like a moonscape but rather like the tide went out. 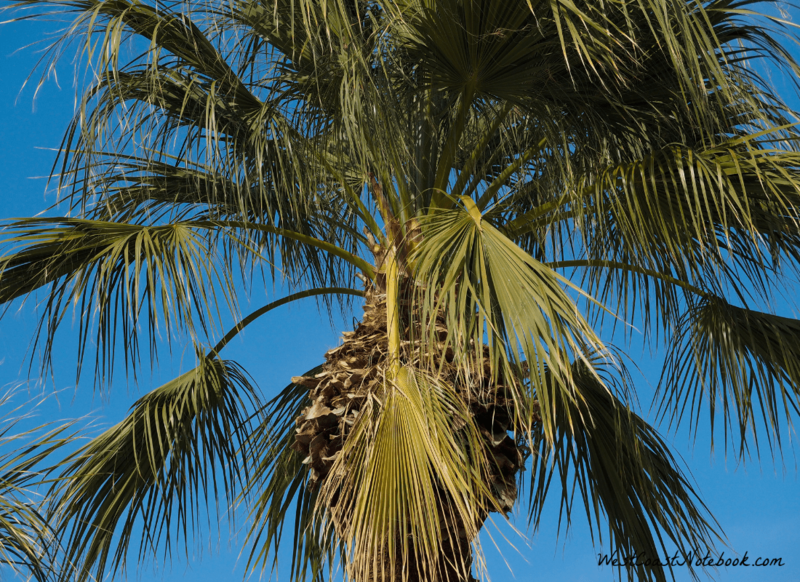 We passed huge orchards of date palms but nothing was open to buy some as it was Thanksgiving here in the states. Going down one road towards the water near the town of North Shore there was a yacht club. Nice building (now turned into a community center) with cement ramps down to where the docks would have been. It must have been built just before the sea started to disappear as everything seemed brand new. You can see from the pylons that the water level was about 10 feet below where it should have been and all the docks have been taken out. Even if they still had docks you wouldn’t have been able to access them. 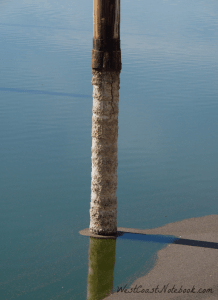 In the picture below what looks like a mud flat was once the entrance to the harbour of the yacht club. 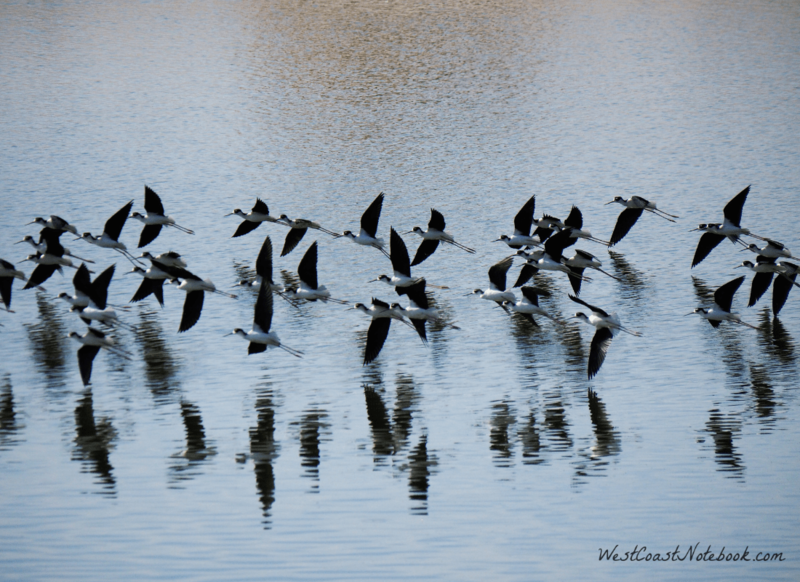 I spotted some birds flying and it was only when I downloaded them on the computer that I saw they were Black-Necked Stints. Very cool. There were numerous parks along the sea and you could see where they use to come right up to the water, but no more. We didn’t get out as there were areas that were literally covered in midges and they were bouncing off of the windshield whenever we stopped. Lots of deserted places and it must be a bit of a depressing place to live with a decaying, boarded-up house next to you. By this time we had travelled past Calipatria and there were miles upon miles of cattle in feedlots. Lots of farms in the area as well with hay and veggies in the fields. I spotted a wildlife sign so down the dirt road, we went. 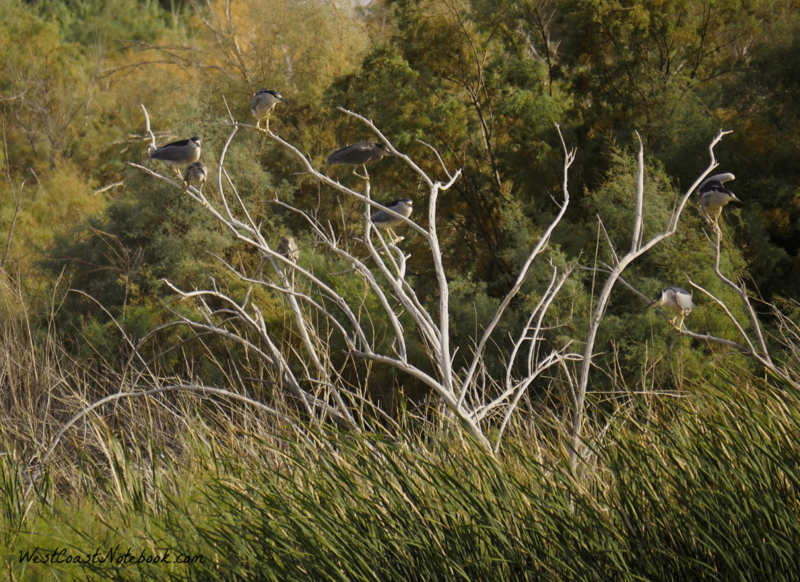 Turns out it was Ramer Lake and there were lots and lots of birds. Trouble was it was extremely windy and the birds were offshore. 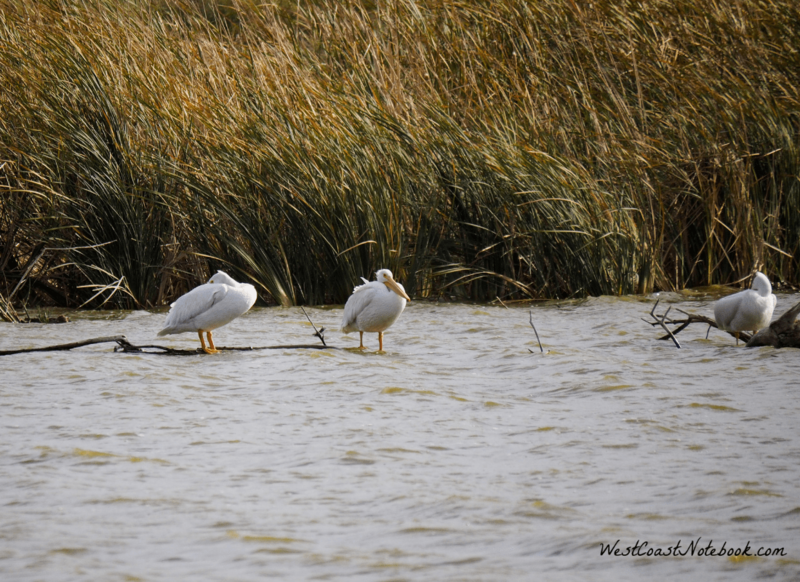 We managed to identify some white pelicans, lots of cormorants, assorted ducks and a tree filled with Black-crowned Night-Herons. 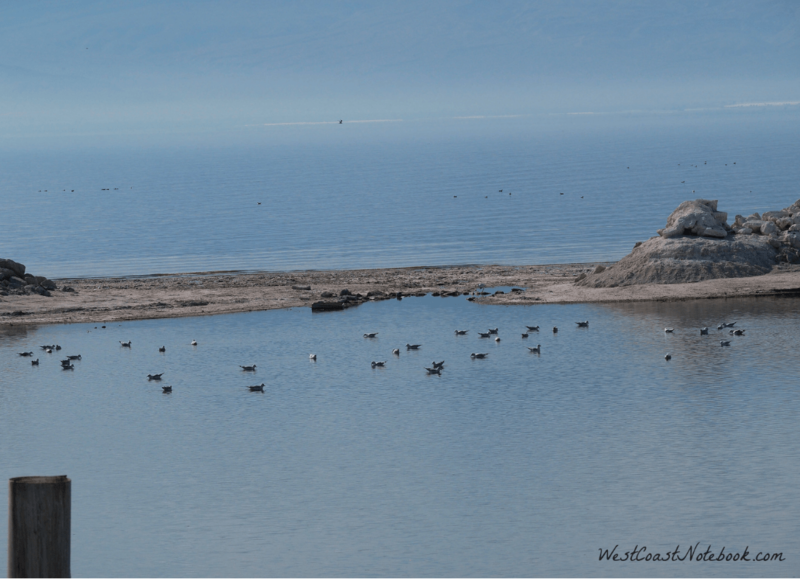 I would have loved to have camped there and gotten up in the morning to calm waters and birds aplenty. We saw one man doing just that and I was tempted to see if he wanted company. Leaving the lake we headed south looking for Highway 78 that would take us back up to Highway 10. This was one road that we had not travelled before and as Palo Verde looked like it might be a nice place to stay so we set that as our destination. Palo Verde is or was, a couple of houses and a sign. That’s it! Hence… we ended up in Blythe for the night. But not before we saw something so awesome you would have to experience it to explain it, but I will do the best I can. 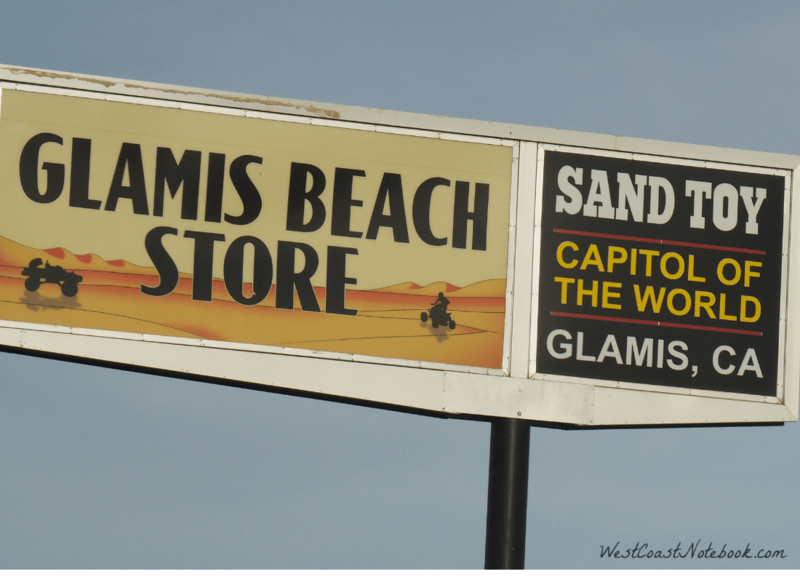 Before we got to Palo Verde we saw a sign that said Glamis, 7 miles. The first thing we saw was a line of what looked like single wide trailers up on a ridge as we came down a hill. I thought maybe this was a company town and these were trailers that people lived in as they all shone in the sunlight. But… when we got down a little farther it was just incredible. It was a line of motorhomes and ATVs as far as the eye could see. They were everywhere and parked all over. 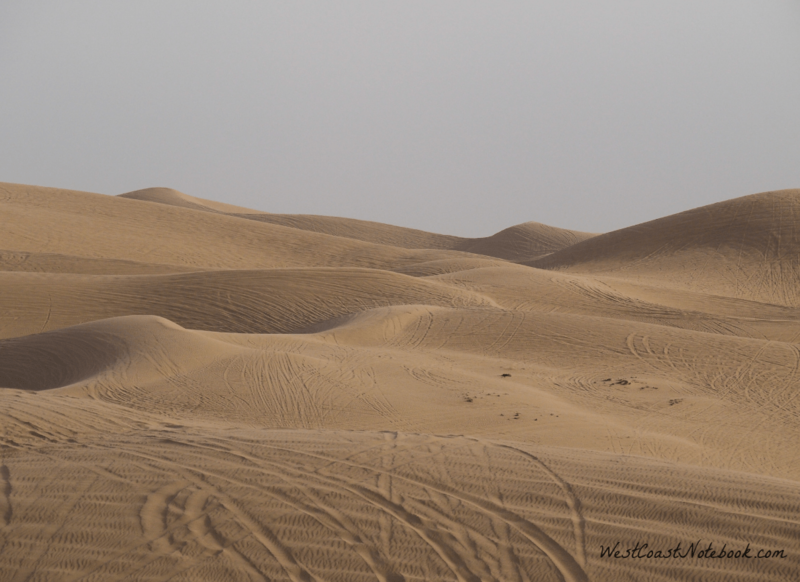 Its official name is North Algodones Dunes Wilderness Area but everyone just called it the Dunes. Keeping in mind this was Thanksgiving and most people were on holidays, the place was just packed. 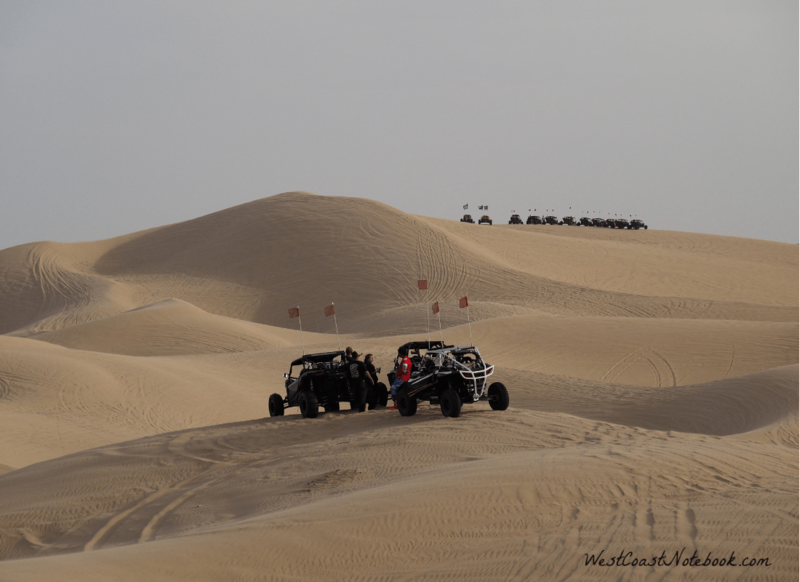 ATVs, dune buggies and 4 wheel vehicles were everywhere crawling over the dunes. In one spot we saw on that had overturned and about 5 other vehicles were helping to upright it. Driving up to an outlook area you could see the vehicles like little ants crawling all over mountains of sand. Especially when we saw someone doing a photo shoot of what looks like a half-naked woman. Turns out she did have a thong on but it wasn’t apparent at first. Everyone was having so much fun. We met a couple of girls about 10-12 years old that had custom made ATVs and they come there four times a year to play. They revved up their motors and took off in a cloud of dust. There were search and rescue vehicles there as well and everything seemed well organized even though it looked chaotic. The amount of money that had been spent to get people there must have been over the top. Most had a fancy motorhome, custom ATVs and big trucks to carry them. Mom and dad each had one and the kids or they had a bigger one that carried the whole family. 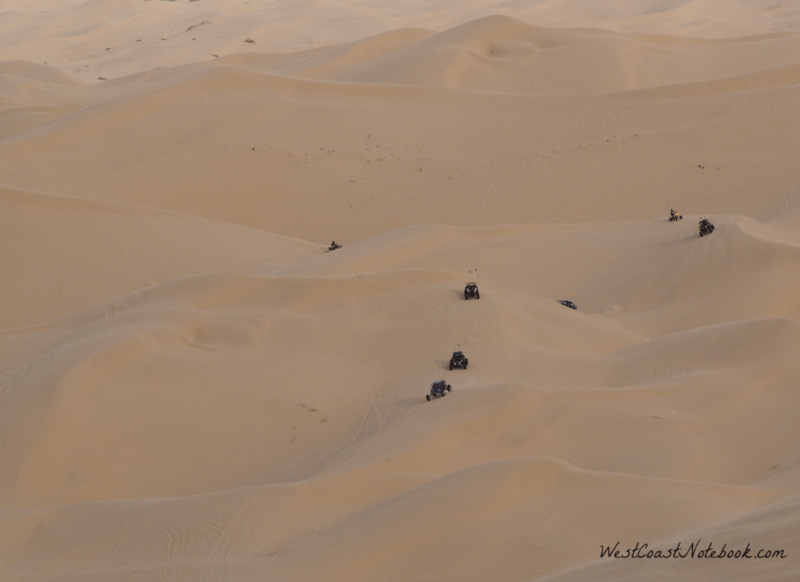 Chrome, colour and gadgets covered the dunes but everyone wore helmets and had roll bars. Was a highlight of the day. Leaving Glamis and heading towards Palo Verde the road was like a cross-country course. A sign would say “dip” and for the next 3 miles, you would go up and down and up and down like a rollercoaster. When you dipped, you couldn’t see over the hill ahead and we must have looked like a large caterpillar if you took a picture from in the air. Finally leaving Glamis far behind we arrived in Blythe and found a nice place to stay with Denny’s close by where we ended up having Thanksgiving dinner and tumbling into bed. Another wonderful day in California.